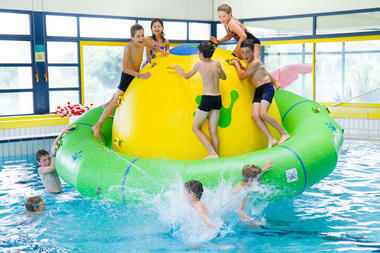 Les Balnéïdes water park in Fouesnant, South Finistère, has all the aquatic fun you could wish for. 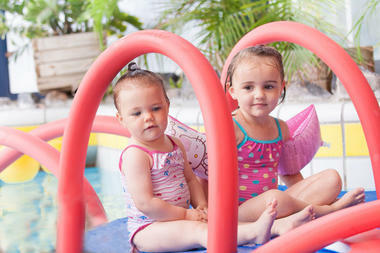 Take some time out in a tropical setting whatever you're into: sport, fun, or just relaxing! With water heated to 29°C, Les Balnéïdes water park brings the tropics to Brittany's Riviera. It's situated in Fouesnant, a town with a view of the Glenan islands. You can relax, burn some calories or just chill out with your family or friends. For the day or a whole year, the water park invites you to explore the pleasures and benefits of water in a welcoming family environment. With games, waterfalls, slides and themed evenings, the kids will have the time of their lives in the paddling area and leisure pool. The 'double rocker' and 'spinner' are great fun! To relax, adults can take advantage of the Jacuzzis and massage jets as well as a wellness centre, which features a sauna and a massage service (prior booking required). More athletic types have plenty to do: there's a sports pool and a variety of swimming lessons and water aerobics courses available. Whatever your age, the perfect place for sport is in the water!